Prohibition was a nationwide ban in the United States from 1920 to 1933 on the sale, production, importation, and transportation of alcoholic beverages. It was promoted by the Dry Crusade, a movement led by groups such as the Woman’s Christian Temperance Union and the Anti-Saloon League, which garnered significant support from the rural Protestants and Social Progressives of the era. The Dry Crusade led to the passage of the Eighteenth Amendment to the United States Constitution. This was followed by the enacting of the enabling legislation, the National Prohibition Act, more popularly known as the Volstead Act, which set down the rules for enforcing the ban and defined the types of alcoholic beverages that were prohibited. The National Prohibition Act did allow for some exceptions. For example, farmers were permitted to make wine for their own consumption; and priests, ministers and rabbis were allowed to serve it during religious ceremonies. Doctors were also permitted to prescribe alcohol for medicinal purposes. Private ownership and consumption of alcohol was not made illegal under federal law, although in some areas the local laws were stricter, with some states banning possession outright. While Prohibition was somewhat successful in reducing the amount of alcohol consumed, it created a situation that led to the proliferation of organized crime. Prohibition gradually lost its supporters, while opponents touted the infringement of personal liberty, the growth of organized crime, and the loss of tax revenues from the legal sale of beer and liquor that could benefit the government as the country entered the Great Depression in 1929. Prohibition ended with the ratification of the Twenty-first Amendment, which repealed the Eighteenth Amendment, on December 5, 1933. 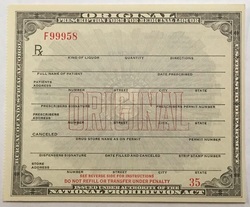 The item in my collection is a blank Prescription form that would have been used by a physician to prescribe a person to purchase alcohol for medicinal needs.